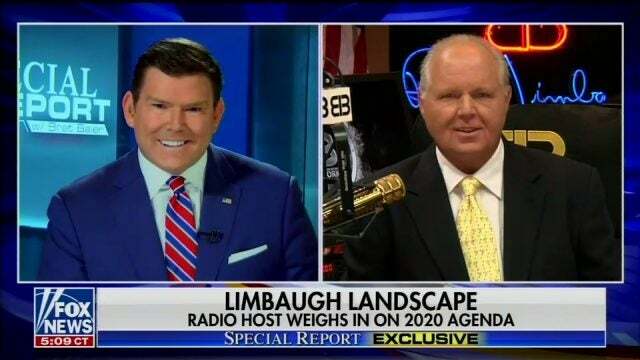 BAIER: — we turn now to syndicated radio talk show host Rush Limbaugh. He joins us live from his studio. Good evening, Rush. Welcome to Special Report. RUSH: It’s great to be here. This is a milestone for me, my first-ever appearance on your program, and I’m honored to be here. BAIER: Well, thanks. You know, it’s been a couple of days since the attorney general wrote that four-page letter describing his conclusions from the Mueller report. What’s your assessment of the fallout since that time? 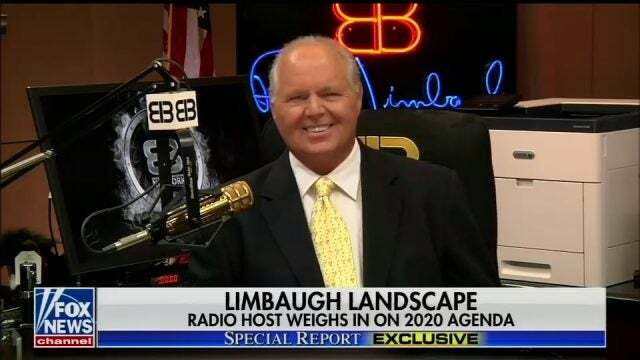 RUSH: I think all the fallout’s a bunch of distraction. We’ve gotta keep track of exactly what this was, Bret. There was zero collusion. There was no collusion. There was never any evidence of any collusion between Trump or his campaign and Russia. Zilch, zero, nada. They began an investigation based on a phony dossier that was created and written by associates of Hillary Clinton. It was opposition research. This is outrageous what has happened here. There needs to be an investigation into this. There needs to be accountability for everybody who participated in this, from people high up in the Obama administration all the way down and including most of the mainstream media. It has been two years that we have been distracted. This country has been placed through… It’s gone through hell here! The people of this country were told their president was a traitor. They were assured their president had colluded, had stolen the election. None of it happened, and the special counsel has known there was no collusion since before the investigation began. There has never been any evidence of it. I don’t care what Schiff says. I don’t what Comey says or any of the rest of them. This whole thing is a manufactured coup, because these people could not accept the results of the 2016 election — and they’re continuing it, Bret. They are continuing to try. You look at Swalwell and you look at Schiff. Their conduct illustrates that this is an ongoing political project to get rid of Donald Trump. It has nothing to do with finding out if a foreign power had anything to do with our elections, because a foreign power did not. SWALWELL: I think he acts on Russia’s behalf and he puts Russia’s interests ahead too often of America’s interests. 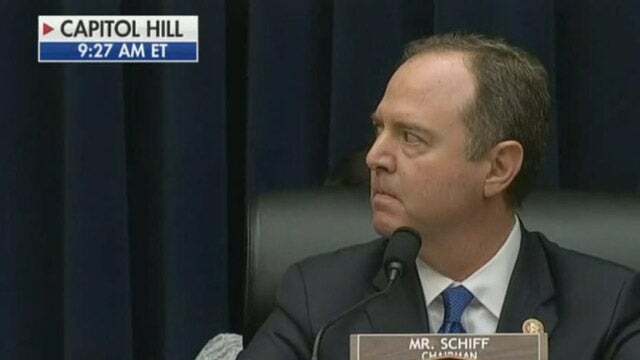 SCHIFF: There’s ample evidence of collusion in plain sight and that is true. There’s a difference between there being evidence of collusion and proof beyond a reasonable doubt of a crime. BAIER: What do you think of that? RUSH: There is no evidence of collusion! The man is lying through his teeth. This is exactly what I mean by, “They’re trying to keep this alive.” I heard today in the New York Times (paraphrased), “Hey, guess what? The Mueller report’s actually 300 pages and Barr summarized it in four? There must be something in it!” Are they serious about this? They really…? Pelosi and the rest want us to believe that Barr is lying about what’s in this report, that there is evidence of collusion in this report? If that’s true, what must they think of Barr? What must they — and where is Mueller saying, “Hey, wait a minute. Barr is lying about this. I found collusion. I found obstruction. It’s in my report”? Mueller isn’t saying that; neither are the 19 pro-Hillary members of his staff saying that. This is… Bret, it’s just continuing. Swalwell and Schiff are lying to the American people ’cause they can’t give it up. It is outrageous, and some of these people need to be held to account. I hope the president calls for a special counsel to look into this, because the American people deserve to know how they have been manipulated, how they have been used. They deserve to know what the Democrat Party and the American left — descending from the Obama administration — attempted to pull off here, and it better never, ever happen again. This is one… This is probably the biggest political scandal certainly of our lifetimes and maybe even longer. THE PRESIDENT: I have plans to declassify and release. I have plans to absolutely release. But I have some very talented people working for me, lawyers. I thought it would be better if we held it to the end. No, but at the right time, we will be absolutely releasing — and I did the right thing by not doing it so far. BAIER: So do you think…? You’re calling for a special counsel. I mean, is there special counsel, kind of, overload with the American people? RUSH: What was that? “Is a special counsel” what for the American people? BAIER: Overload. Would people be tired of investigation after investigation? RUSH: Oh, there is that possibility. How else are we gonna get to the…? You know, I understand. Another two years, could the American people put up with it? I ask myself the same question. But the president is right. If he would declassify… You know what I wish he would do? Declassify everything to do with FISA and everything to do with this investigation, then announce that he’s closing the border and shutting down immigration ’til we can get a handle on it, and then pardon everybody that has been abused by this unnecessary investigation. You mentioned FISA. For crying out loud, where are the FISA judges on this? A phony opposition research document called a dossier was used four times. There’s not a shred of evidence in it. None of it has been corroborated, and they used it to get warrants to spy on the opposing presidential campaign four different times — and there’s never been any evidence of collusion! I keep repeating this because I’m adamant the American people understand exactly what has happened here. This is a huge hoax that has been perpetrated that makes every other hoax in our lifetime pale in comparison. Not a shred of evidence. That FISA warrants, all four of them, were based on absolute lies put together by Hillary Clinton’s campaign team, and they defrauded the FISA court to get warrants to spy on people with it. It’s outrageous to me. BAIER: So you, Sean Hannity, Laura Ingraham, Mark Levin — a small group — believe that from day one, and we can take back to two years ago, you were saying roughly the same thing. It’s one of the reasons I wanted to talk to you. You know, when you go around the country, Rush, there are some people who support the president’s actions, what his administration is doing. But they don’t like the way he tweets or talks or attacks his opponents. What do you say to those people? RUSH: I say he should continue tweeting. Look at the forces that are aligned and arrayed against him, Bret. He has what everybody thinks is a media. We don’t have a media in this country. There isn’t a group of people going out and reporting “the news” and then telling us what happened that we didn’t know about. What we have are Democrat activists. We have left-wing hacks that are disguised as journalists that are helping propel the effort to get rid of Donald Trump. The only pushback he has, the only opportunity to get his side of things out is via his tweets. So I hope he keeps tweeting. Plus, they’re funny. They’re great. I love having them to talk about and I hope he keeps it up. It doesn’t… Look, I’m a Trump supporter, unabashed, and I love them. It doesn’t bother me in any way, shape, manner, or form. I have some people telling me, “You know, you ought to tell him to stop tweeting.” I wouldn’t. I want him to keep doing it. 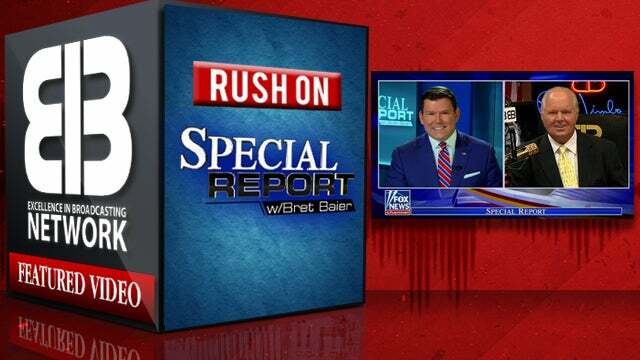 BAIER: Well, Rush, if you wouldn’t mind sticking through the break, we’ll come back and talk about 2020, and a look ahead, if that’s okay. RUSH: Sure! I’ll be right here. BAIER: Radio talk show host Rush Limbaugh after a quick break. PELOSI: …all would be ended if the president gets his way. We will fight that, and fight that in the Congress, we’ll fight it in the court and we’ll fight it in the court of public opinion, as I’m fond of saying. We stand ready to make health care better, uh, to reach our goal of ever-expanding access, many more people, better quality, more affordable health care. RUSH: I kind of understand people saying this. My preference would be for the president to zero in on the border, to zero in on immigration and stop this. We are being invaded. We’re being invaded by a bunch of people that has the potential here to totally destroy the makeup of our culture and the makeup of our society and the Democrat Party and the American left are in total support of this. It’s got to stop. The president got elected on that issue, and it’s not solved. The wall has not been built and the border is still wide open. It needs to be shut down. You know, we stopped immigration in this country from the 1920s through 1965 to allow those who had immigrated in the 40 previous years to assimilate. There isn’t any assimilation happening here, and I think that ought to be his primary focus issue-wise. BAIER: And so in the EIB Studios, you were scratching your head about health care? RUSH: I’m sorry, I’m having some connection problems here. Would you say that one more time? BAIER: You were scratching your head about the health care decision about going this way coming out of the…? RUSH: Well, no, I understand. I understand it. It’s an issue that the Democrat Party has owned. I know the president would loooove to take it away from ’em and have this be something that the American people rely on the Republican Party for. But unless… It needs to be done right, and it needs to reemphasize the free market and private sector. It’s the only way we’re ever gonna get costs down. And if anything we do in health care expands the government role, it just isn’t gonna work out and isn’t gonna improve anything. So I’m really just… I wish that we would focus on immigration. We don’t know how much time we have to do this, and it’s imperative while he has this political capital now — especially after prevailing here in this and beating back this silent coup — to take every bit of political capital he has and use it on the border. BAIER: What about the 2020 candidates? What do you look at that…? The over-under is 20, potentially, Democratic candidates. Your thoughts on the field? RUSH: I think it’s beatable. I mean, you take a look at the Democrat Party. What are they talking about? “We’re diverse, we’re wide open, we got every demographic,” and who is leading in their polling data? A 77-year-old white guy followed by a 75-year-old white guy. This is not what they want. I don’t think the Democrat Party wants to nominate an aging, old, white dinosaur from Jurassic Park and the old-fashioned days of their party. But whoever they nominate, Bret, I think they’re eminently beatable. I don’t think the Democrat Party — particularly this new push to extreme, leftist socialism — has any chance of being supported by a vast majority of the American people. We’re not there yet, and we have to beat it back. But I’m glad there’s so many running because it’s gonna be a hoot as these people try to out-leftist each other and compete against each other about who can destroy America this way the fastest or who can get America out of this country the soonest or what have you. But they don’t love. They don’t speak positively. The Democrats are not laughing. They’re not havin’ a good time. They don’t seem like to enjoy life. Everything is apocalyptic. “The climate is gonna destroy us in 12 years!” Why worry about…? If we’ve only got 12 years to live, why even worry about our trash? You know, what’s the point? If all we have is 12 years — which is absurd, anyway. But that’s what they want their campaign to be about. Then have at it! Because I just don’t think the American people want to be led down the path to apocalypse and who can get us there first and who can get us there safest. BAIER: Last thing, Rush. You’ve been doing this a long time. Have you seen the country this divided? RUSH: Not in my lifetime, no. Obviously, it was greatly divided during the Civil War. But I think one of the reasons why the country is divided the way it is now, Bret, is I think the media is a central figure in this. The media used to pretend that they were not a participant in the ongoing events of the country, that they were casual observers that were fair and objective. But they’re not anymore. They’ve chosen sides, and they have become political activists — and, as such, there isn’t any news anymore. There’s a daily attack, countless attacks on Republicans left and right — led by Donald Trump, led by conservative media being attacked. And so the Drive-By Media and the American universities have created, I think, this radical left portion of our population that views life as a war. And every day is a battle. And the war is against Republicans and conservatives. And they must win it every day. And so the country is perceived to be constantly at war, in battle. And I’ve not seen it like this in my lifetime. It’s been close. I mean, they hated Nixon, and there were problems with Reagan. But I’ve never seen it as partisan and as destructively divided as it is right now. BAIER: Well, we wanted to have you on, get your analysis, used up a panel segment for you because we wanted to hear what you had to say. Rush, we you appreciate you coming on Special Report. RUSH: Say, I’d love to be on the panel and analyze what I just have said — you know, have a second go at it. RUSH: Maybe we’ll do that some day. (laughing) But I really do appreciate being here. Thank you so much for having me. BAIER: All right, Rush. Thanks.